I remember my first PPT presentation for a media training for a group of NGOs. I created a slide for literally every part of the one hour-long training, in urm, full sentences. The result, nearly 50 slides! That memory still haunts me with fresh horror; and it seems us professionals haven’t got much better at making presentations. A recent report by David Paradi, “2017 Survey of Annoying Power Point Survey”, shows that not much has changed in the last decade or so. While usage of PPTs have risen, 74 % of people interviewed for the survey report seeing at least one to two PPTs every business week ( more than double over the last ten years); the common traps remain the same. 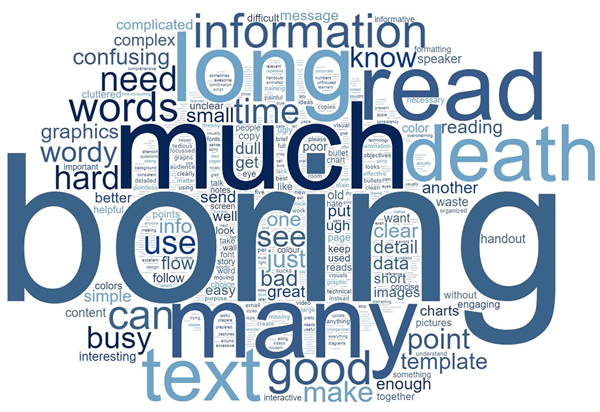 One of the biggest issues during presentations is the sheer volume of informations. This word cloud, created by David Paradi’s ‘ Think beyond the slide’, shows common reactions to most PPTs. It includes words like ‘Boring’ and ‘Long’ and err, ‘Death’ ! Death by PPT am guessing:). Is the less is more rule useful?